Rattle their nerves with your first touch and turn the game with your second in these Nike5 Elastico Finale Indoor trainers - the ultimate 5-a-side boots for indoor surfaces, designed to create space where there is none. 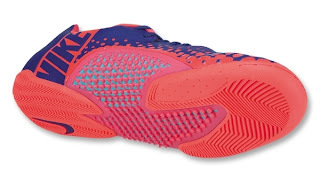 Featuring an all over Kanga-Lite upper for fantastic comfort and enhanced touch, the Elastico Finale's debossed dots transition from underfoot fins into the upper, medial and forefoot to create a 360 degree touch. 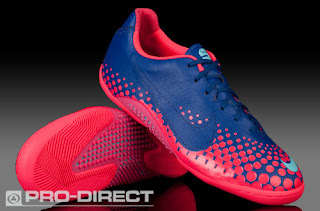 Debossed dots at the forefoot work in conjunction with the Kanga-Lite upper to provide a soft touch or heavier touch depending on the strength of contact with the ball. To help you keep your passing quick and slick, the Elastico Finale incorporates fins of different heights which transition down the instep while the lacing is slightly off-set to the medial side. A moulded ortholite sockliner provides fantastic cushioning to keep you comfortable for the duration of your game. 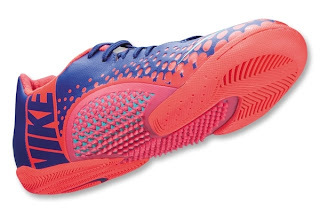 A new low profile court traction outsole, designed specifically for the needs of the small sided game, features rubber pods at the toe and heel for traction and stability. Midfoot and forefoot fins for multidirectional underfoot ball control.